Around 2,500 to 2,000 years ago people began to frequent the stream and river valleys in the area around today’s Nacogdoches County, Texas. At first they were strictly hunters and gatherers living off the land and never staying for long at any one spot. Over the next millennium their descendants gradually came to rely on raising their own crops, living in small hamlets and villages, and making pottery for storage, cooking, and serving. Those living along Naconiche Creek and nearby areas were one of many ancestral communities whose descendants became the peoples we know today as the Caddo. Lake Naconiche takes its name from an obscure Caddo group, the Naconiche. Who are the Naconiche? Of the Naconiche themselves, little is known. Other than their name, their history remains shrouded in mystery. That there was a Caddo-affiliated tribe called “Naconiche” is known only by two short references in 17th and early 18th century Spanish documents, where they are mentioned only in passing. According to ethnologist John R. Swanton, one account said "we hear of a tribe called Nacao ... located on a creek called today Naconicho," but no other detail. The Caddo word “Naconiche” (or Naconichi, pronounced na-ko-na-chi) seems to mean the place (Na) of the “coniche”. According to the foremost linguistic expert on the Caddo language, Dr. Wallace Chafe of the University of California-Santa Barbara, the meaning of “coniche” is not presently known. It probably refers to some food item, as do many other Caddo place names. Unfortunately, there are no direct links between the archeological remains of the Naconiche Creek area and the historically mentioned Naconiche group, or tribe. Nonetheless, the term "Naconiche Caddo" usefully designates the distinctive archaeological pattern left by prehistoric Caddo peoples in the Lake Naconiche area. Around A.D. 500-800 there were several different Woodland traditions in the Caddo area, such as Fourche Maline and Mossy Grove (see Woodland Cultures). How the various archeologically identified Woodland cultures, such as Fourche Maline, Mossy Grove, and Mill Creek, came to be “Caddo”, is not a clear path. It is important to understand that Caddo peoples have had a long and complex history—genetically, culturally, and ethnically. It is somewhat ironic that when archeologists lump together diverse cultural backgrounds and traditions and call that Caddo to give the region an identity, we lose the diversity that is Caddo. The Lake Naconiche project underscores that diversity. As a result of this project, we can now say definitively that the Caddo that lived along Naconiche Creek are the product of a variable and interesting history, the specifics of which are unique. Lake Naconiche is located in Nacogdoches County, Texas, about 12 miles northeast of the city of Nacogdoches, Texas, in east Texas. The lake is part of the Attoyac Bayou Watershed which extends approximately 82 miles through Rusk, Nacogdoches, San Augustine, and Shelby counties before emptying into Sam Rayburn Reservoir. At the time the research presented in this exhibit began in 1999, there were only two documented archeological sites in the project area. The plan to dam Naconiche Creek and create a small reservoir presented an opportunity for a long term archeological project looking at the prehistory of an area in East Texas that no one had really ever looked at before. Lake Naconiche covers an area of over 1250 acres and is some 20-25 miles away from the nearest major documented Caddo sites. 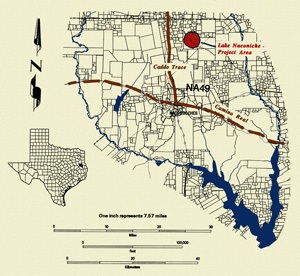 The major archeological excavations at Lake Naconiche were carried out between May 2003 and May 2004 by Archeological & Environmental Consultants, LLC, a private consulting firm specializing in Caddo archeology. This part of East Texas is situated within the central part of the Pineywoods, an area covering nearly 55,000 square miles. 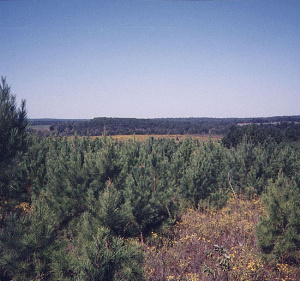 The Pineywoods have broadleaf deciduous forests in wetter habitats, and shortleaf and loblolly pine forests on upland fine sandy loam soils. Bottomland plant communities along the Angelina River and Attoyac Bayou drainages contain a hardwood and swamp forest (including cypress, tupelo, and sweet gum), with natural levees and alluvial terraces, point bar deposits, old stream channels, oxbow lakes, and backwater swamps. The hardwood bottomlands present along Naconiche Creek and its small tributaries are less diverse than that present in the larger valleys. The climate of the region is humid, with a mean annual precipitation of at least 125 cm (49 inches). Periods of maximum rainfall occur in the spring and fall seasons, and the growing season ranges between 214-254 days, with the last freeze occurring in late March and the first freeze in early November. Droughts are not uncommon, and analyses of tree rings for the last 1000 years reveals numerous prolonged wet and dry spells during that era. The Lake Naconiche project area was thickly wooded, with considerable stretches of pinelands and pastures at the upper end of the project on broad uplands and valley divides, as well as a mixture of second-growth hardwoods in areas that have been harvested for timber since the late 1800s. Much of the remainder of the uplands in the project area have relatively steep slopes with tall timber. Through the mid-19th century, before the whole area was logged-over and almost farmed to death, the uplands, especially in settings with very deep and well-drained sandy soils, would have looked much as it did in Woodland and Caddo times, 500 B.C. to A.D. 1600. There was a diverse forest canopy consisting of a mixture of pine and oaks, including blue oak (Quercus incana), blackjack oak, post oak, and red oak, trees that would have provided an annual abundance of nuts as a source of food for those living in the area. Environmental conditions would have been generally similar to modern times, with some nasty droughts along the way. The wetter years with heavy spring rains would likely have been optimal growing years for Caddo horticultural groups dispersed across the landscape. Generally warmer and wetter conditions are optimal for increasing the yield and predictability of the maize crop. Wetter conditions would also have led to an increase in the extent of swamp and wetland habitats in the Angelina and Attoyac basins, creating an abundance of woodland-favoring plants and animals in the area. The drought periods, especially those that exceeded two years in length, would have been trying times. Prolonged dry spells would have limited the ability of Caddo groups to produce sufficient and predictable food supplies. Drought would have interfered in nearly every aspect of their lives. Agricultural crops would fail, not only depriving the Caddo of food, but also of seed stocks for future crops. Droughts would have hindered the success of many maize harvests. Bad droughts probably also affected the constancy of flow in the numerous upland springs in the area, as well as the volume of flow in the Angelina and Attoyac basins, which in turn would have influenced the relative quantity and diversity of naturally available animal and plant foods in floodplain and upland forested habitats. During drier times, particularly after 600 years ago, it is likely that Caddo farmers in the area created larger cleared areas through their horticultural practices, which included deliberately set fires to open forest lands. The extensive agricultural clearing combined with less surface water would have in turn diminished the supply of animals and plants normally hunted and gathered in the area. This exhibit forms a narrative telling the story of the prehistoric Naconiche Caddo and of the research upon which it is based. Those who are more interested in a broader overview of Caddo prehistory and history will want to visit the multifaceted exhibit set known as Tejas: Life and Times of the Caddo. Main introduces the exhibit and describes the setting. Investigated Sites details the investigations of key archeological sites during the Lake Naconiche archeological research project. The next three sections cover some of the same details, but are organized chronologically and focus on interpretation. These sections trace the prehistory of the Lake Naconiche project area through time beginning about 2,500 years ago and continuing for some 2,000 years until just before the arrival of Europeans in the region. Woodland Period Settling In discusses Woodland occupations prior to about A.D. 800. Caddo Transformation describes the development of Caddo life in the Lake Naconiche area, between about A.D. 800-1200. Naconiche Caddo Florescence highlights the tight-knit Caddo communities that thrived in the area from around A.D. 1200 until about A.D. 1480. 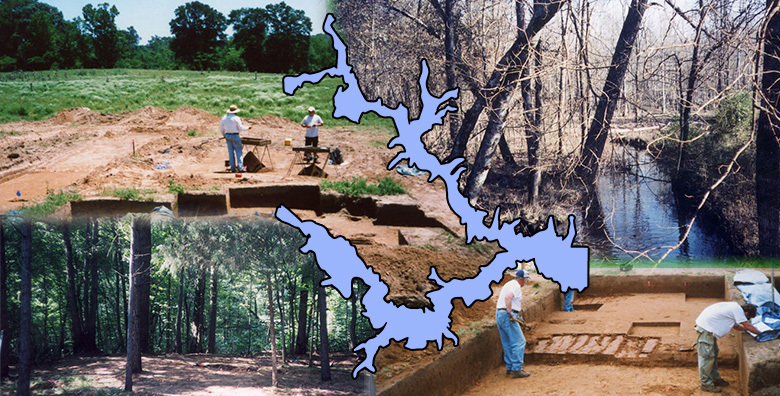 Teachers provides a timeline lesson plan to help 4th-7th-grade social studies students understand how the prehistoric evidence uncovered at Lake Naconiche fits into the overall history of the Nacogdoches area. Caddo Involvement explains the Caddo Nation’s role in the Lake Naconiche project. Credits & Sources acknowledges those who carried out the research and created this exhibit and provides references to sources of more information. 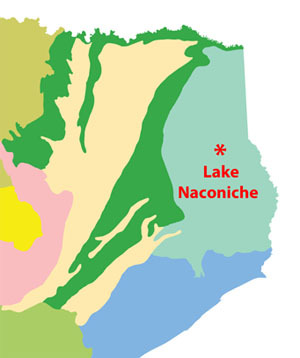 Nacogdoches County, showing the location of the Lake Naconiche Project area. 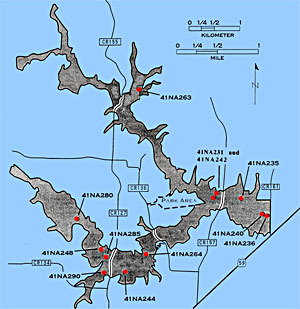 Lake Naconiche project area showing the locations of the key investigated archeological sites. 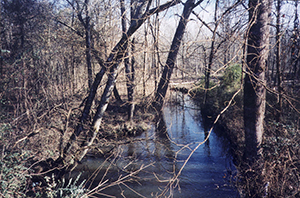 Naconiche Creek, a tributary of Attoyac Bayou, which in turn drains into the Angelina River. Lake Naconiche lies within the central part of the Pineywoods natural region of Texas. Base map, courtesy Texas Parks and Wildlife. View of the pinelands and pastures in the Lake Naconiche area during the archeological investigations before the lake was built. Although prehistoric Caddo farmers cleared farms and gardens within the forests, prior to the mid-1800s most of the area was still thickly wooded in primary succession forest. Since then most of East Texas has been timbered numerous times.